I've not been near a gym in ages - how scared should I be?! Many people who've never been to an exercise class have nightmarish visions of it being some kind of hour-long fitness labour camp, complete with a steely-thighed instructor bellowing for yet another 20 press-ups. Well, fear not. This is the twenty-first century, the age of consumer choice and satisfaction, and there are a wide range of exercise classes available these days designed to cater for all different levels of fitness and skill. You can even have some fun in the process! Exercise classes are a very sociable way of getting fit; you are surrounded by other people of a similar ability who are all there with the same goal. It can be really motivating to exercise with other people as there will always be encouragement (gentle, not bellowing!) to keep pushing a little bit harder when you're ready to give up. What's more, having a class at a fixed time every week means that you'll quickly incorporate it into your weekly schedule. What are the gym class options? As it's sometimes difficult to know where to start when looking for a class to join, here are some of the most popular exercise classes and a brief outline of what goes on in them. This is an all-over body toning class that focuses on a series of low impact exercises. As a moderate intensity class you'll be able to cope with the pace as long as you do some physical activity occasionally. This is a high intensity class that is very good for improving strength stamina and speed. Expect to do sets of press-ups, sit-ups, sprints as well as jogging. Not for the faint-hearted! A body conditioning class that incorporates a series of punches and kicks into an aerobic workout set to music. Don't worry - it's not as scary as it sounds! Another moderate intensity class. Pilates focuses on core strengthening and flexibility which will help improve your balance, strength and posture. This is a low intensity class that is sometimes done barefoot, so you can take up pilates even if you do very little physical activity. This is very similar to body sculpt, but concentrates on toning and firming parts of the lower body, such as the stomach, bottom and thighs. Moderate intensity. 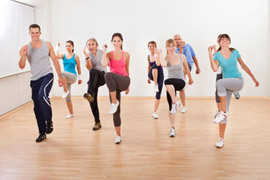 Step classes are aerobic based workouts that benefit mainly the lower body. They vary in intensity from low impact to high impact classes and a sports centre will often run several classes that are suitable for different levels of fitness. Step classes are not really suitable for anyone with knee problems. These are exercises based on improving your flexibility, balance and general sense of calm well-being. There are different levels of yoga classes from beginner to advanced. The activities mentioned above are just a few examples of the many different classes offered by most leisure centres and health clubs. Bear in mind that they may be called something slightly different, and also that there are often different intensity-level classes for the same activity. Speak to a member of staff to find out which class will suit your levels of fitness and goals the best. So why not get along to a nearby leisure centre and give it a try? Classes are generally good value for money, and a lot of fun. All you need is a decent pair of trainers and the right attitude!